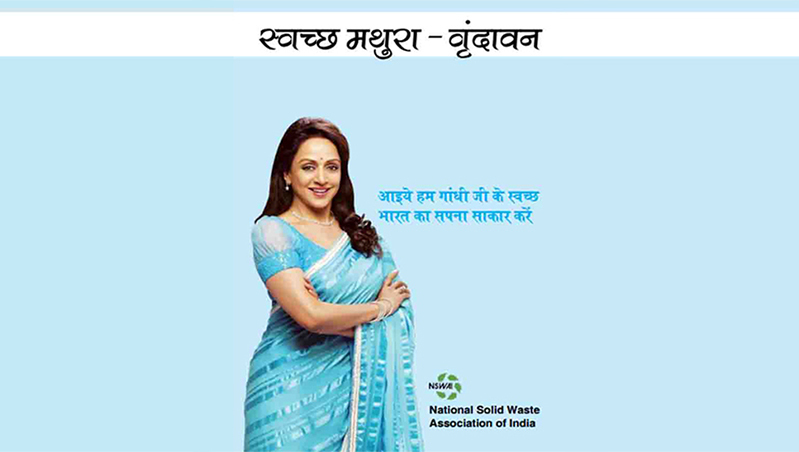 HEMA MALINI, MP MATHURA, RENOWNED ACTOR, BRAND AMBASSADOR OF NSWAI, WASTE MANAGEMENT EXPERTS. Member Parliament and renowned actor Hema Malini is a brand ambassador of NSWAI. The actor-turned-politician representing Mathura in the Lok Sabha is actively involved in waste management sector with a motto “Swachh Mathura, Sundar Mathura”. She picked up the broom to propagate Prime Minister Narendra Modi’s “Swacch Bharat Campaign”. She administered a pledge calling upon students and people to commit themselves to cleanliness. she said, “Mahatma Gandhi dreamt of an India which was not only free but also clean and developed.” She went through the main markets urging shopkeepers and residents to ensure that their town remained clean & picked up the broom to demonstrate how people should keep their surroundings tidy. Every month she goes & talks with residents, students, shopkeepers, municipality staff & workers on how to keep Matura & Vrindavan clean & beautiful. She has planned to set up plants for waste management at Mathura & Vrindavan. The gas from these plants would be used for cooking while fertiliser would be used by the farmers. It would also pave the way for clean Mathura and Vrindavan. She also attracted the attention of the parliament on the plight of Yamuna which has become a drain carrying the raw sewage from Delhi. In an attempt to rejuvenate river Yamuna, she has asked the Centre to undertake Yamuna cleaning project alongside Ganga project. She met Prime Minister Narendra Modi and handed over her plans for Yamuna cleaning & Development of Mathura & Vrindavan. She was involved in many similar projects like ‘project Ganga Sparsh’, cleaning up of Juhu beach area in Mumbai etc. Apart from the waste management, she has adopted Rawal village & is working to boost tourism to create employment opportunities & for an all-round development of Mathura. 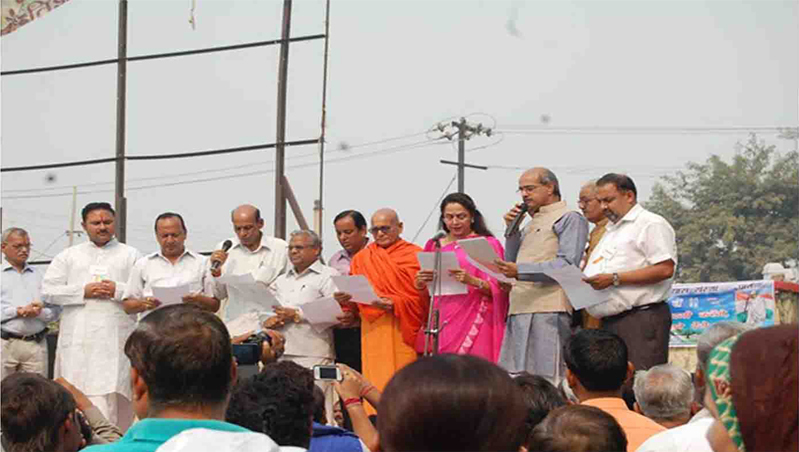 Mathura MP Hema Malini (BJP) administered the Swachh Bharat oath to a large group of students and Vrindavan residents. In the oath-taking ceremony taking place in Gandhi Park, hundreds of students from different schools gathered to hear their Member of Parliament speak on the “Clean India” push coming from the Prime Minister.